It’s easy to make your own traditional pork stuffing and sausage rolls with this full-flavoured sausage meat from the Riverford butchery. We use prime organic pork from free-range, grass-reared West Country pigs, and prepare it just how we like it: not over-processed, so it stays satisfyingly coarse and meaty. Have a look at our sausage meat stuffing recipe for a bit of inspiration. 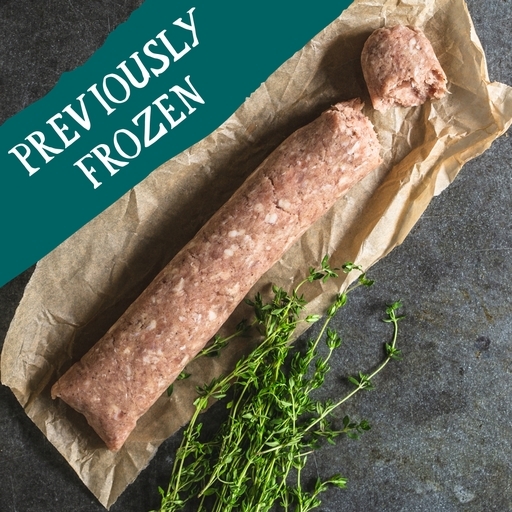 Our pork sausage meat have been previously frozen, so will not be suitable for home freezing. Previously frozen. Defrost thoroughly before cooking. Perfect as a base for your festive stuffing, sausage roll filling, or coarse pâté. Make sure the meat is thoroughly cooked before eating. Keep in the fridge, below 5°C. Sausage meat will be pre-frozen and so cannot be frozen at home. Pork (87%), seasoning (potato starch, sea salt*, white pepper, ascorbic acid E300*, black pepper, ginger, sage, sugar, nutmeg, thyme, rosemary extract), water*.